On Friday, October 23, 2009, Darrin Gurganious shared with New Beginnings Church in Currie, NC about the true meaning behind Halloween - where it originated from and what different "traditions" signify today. It was an extremely informative event where he shared from his past. You might ask what gives someone the knowlege or expertise to speak on such a subject? We too ask that. 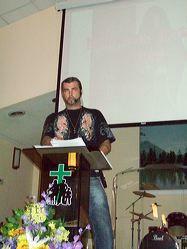 What really made this a great event was the testimony of Darrin. He was a Satanist for 24 years of his life and a recruiter for the occult. As he was going to commit suicide one day, the Lord spoke to him and told him to "stand up"! The devil was ready for Darrin to sacrifice himself but God got a hold of Darrin and he came to the knowlege of the truth that Jesus became our sacrifice and that God had a plan. At that point, Darrin was reminded of a liittle church that he had passed while walking to a bridge where he was going to end his life. He went there and talked to the pastor who prayed with him. 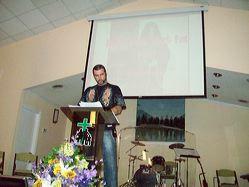 Darrin recieved his NEW BEGINNING right there and has been on fire for the Lord ever since. His life's ambition and mission is to share with people the dangers of the occult and to inform parents and adults of the warning signs that out youth exhibit. He also has an "Adopt-a-Pagan" prayer Program. I can truly say that we will never look at Halloween the same... Look for the video on NBCC TV soon.